This post contains affiliate links and references to a previously sponsored post. Andrew recently started Kindergarten! I can’t believe it! How did our first baby grow up SO fast?! I know I have friends my age with kids starting high school, but as an “older” parent, this huge milestone seems like such a big deal! 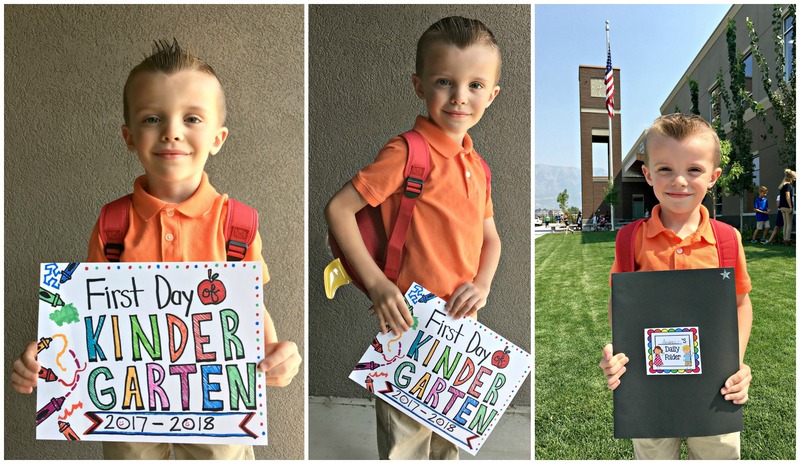 Every year I really enjoy seeing all the cute kids my family and friends share on their First Day of School across social media. This year, it was finally MY turn. And boy am I proud of this kid! We prepared for our first Back to School by getting vaccines along with a new (and much needed) haircut- He picked out the style he wanted! Next, we got to go shopping for school clothes! We had so much fun collaborating with OshKosh B’gosh on a sponsored Back to School campaign to share some of their awesome clothing for this year along with a giveaway! You can check out that fun post here and see the outfits Andrew picked out all by himself! He was especially excited about their amazing selection of outer space themed clothing! I also ordered a bunch of uniform outfits for him from the OshKosh B’gosh Uniform Shop online and they are awesome! I got to accompany Andrew to a “practice day” of Kindergarten the Friday before school started. It was just 45 minutes and gave the kids a chance to meet their teachers and classmates as well as explore the classrooms and activity stations they will be using throughout the school year. I really enjoyed getting a little glimpse of what his days would consist of. I LOVE his teacher! She’s amazing and Andrew thinks so, too! I met some other moms which was awesome. We are excited for new play dates in the future! I was so proud of how brave he was jumping right in to the new and unfamiliar setting and participating in all of the activities. He listened to the teacher and followed directions so well! I also LOVED that at each station, he’d scan the room until he saw me and then smile big and wave. I’m so glad he’s still little enough to love having his mommy around and hope that doesn’t change as he grows up. When it was time for his first day of school, he was all set! It was nice knowing he was already familiar with the classroom and knew his teacher. He had such a great first day and I loved hearing all about what he got to do! I have to admit, it felt so weird knowing he was away at school. The boys already went to preschool, but this just felt so different! A part of me wished I could put a GoPro on him and watch his entire day, or even ask his teacher to live stream the class so I could watch it all at home. I know that would never happen, but a mom can dream! Neither of us cried, but when I came back to school to pick him up, he ran and jumped into my arms and gave me the biggest hug and at that point, I’m pretty sure my heart completely melted. I am so lucky to be his mommy! He is so cute, so smart, and so ready for this fun journey ahead of him. I couldn’t be more happy for him to head Back to School because I know how much he LOVES learning and making friends and I just know he’s going to do great! Andrew was selected with 106 other students from his school who got to travel to Idaho Falls to view the Solar Eclipse in totality. Because he’s in Kindergarten, this meant I got to accompany him as a chaperone. I can’t say enough how grateful we are to the school for this experience. It was seriously AMAZING! My little space boy had been asking us to go about a year in advance and since we have a little baby now, I didn’t think she’d be able to handle a long road trip so I wasn’t sure if he’d be able to see this incredible event. When we heard about the epic school field trip, I HAD to sign up and was so excited to tell Andrew he got to go! This boy jumped up and down for a LONG time when he found out! I’m thankful my husband was able to watch Avalynn the entire day so we could go. I wished Drew, Aidan, and Avalynn could have been part of the experience so we could have had this memory as a family, but it just wasn’t possible. So I’m glad that despite the circumstances, Andrew was able to check this off of his bucket list and I’m so happy and thankful I got to share the memory with him! We arrived at the school at 4am and loaded up on the school buses. It was Andrew’s first time on a bus so of course that was an adventure in itself. Of course, he brought his eclipse pillow! It took about 6 hours to get there but we made it without a problem. Due to the distance, the students were allowed to bring tablets to make the road trip a little easier. I couldn’t help but love the fact that Andrew was playing the Wheels on the Bus game on his iPad while on the school bus and thought it was so cool. We took a lot of naps on the way there and enjoyed a pancake breakfast from the school who hosted us for the event. It was crazy how it gradually got darker and darker right in the middle of the day. In Idaho, we got to view the eclipse around 11:30am. As the sun continued to fade away, there was this magical haze covering the entire area. It was almost like an Instagram filter in real life–such a surreal experience! And it also got colder and colder. Andrew was glad we came prepared with a long sleeve planet shirt because he got super cold! When the eclipse finally happened, it was seriously amazing! I mean, I knew it was going to be cool, but I didn’t realize just how truly amazing it really would be. So hard to put into words, you just kind of have to experience it in person to really get it. It was SO worth the full day trip on the school bus with no AC. We made it back to Andrew’s school around 6:30pm and were happy to hop into bed early after a long but fun day and a huge adventure! And I’m pretty sure I scored some cool mom points on this one! I definitely want to try to see every eclipse for as long as I live and I hope the next one will work for us to experience together as a family! Picture Day was so much fun! Andrew was seriously adorable getting his picture taken and they came out SO cute! He is such a cute little boy! My mommy heart is smiling just looking at this! Still can’t believe my first baby is in school! Andrew and I put together a little video of his favorite things about starting kindergarten to share with everyone. He has had so much fun so far and he just began! In addition to the epic school field trip, he’s also enjoyed learning about music composition, trying the violin, learning sign language, making a volcano, creating fun art projects, making new friends, and of course, recess! His school is amazing and they really go above and beyond with hands on activities to make learning fun for kids. It’s a perfect fit for Andrew and our family! I’m so proud of him and can’t wait to see all the new adventures that come our way throughout the school year! Okay, this is for the super moms out there who have already been through a few years of Back to School. What are your tips for minimizing germs? Our entire family has been sick for a couple weeks with strep throat and then again with the flu. It has not been fun. Luckily Andrew was only sick for one weekend and didn’t miss any school. But mommy, little brother, and baby sister have been pretty sick. I am dreading flu season, so if you have any “stay healthy” tips, PLEASE SHARE! I’ll put in a good word with Santa-promise! What are YOUR Kindergartners (or bigger kids) Loving This Year? FTC Disclosure: This post is NOT sponsored but it does reference a previous sponsored campaign. This post contains affiliate links. Should you make a purchase through one of my links, I may receive a small commission. Thanks for supporting this blog and helping me bring you more great content!